The little-used Olympic Park in Barra da Tijuca could be the future site of Fluminense's new 25,000 seat home stadium. RIO DE JANEIRO, BRAZIL – Welcome news arrived this week for the legion of Fluminense football (soccer) fans across Brazil. 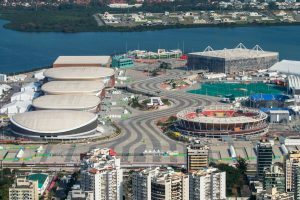 According to local reports, Flu club officials are meeting with Rio Mayor Marcello Crivella this week to hammer out the details of a deal that could finally bring the club its own home stadium at Olympic Park in Barra da Tijuca. Olympic Park in Barra da Tijuca could soon be the future home of Fluminense FC, photo by Gabriel Heusi/Brasil2016. With a total of nine venues, the 300-acre Olympic Park in Barra was the largest of Rio 2016 Games sites. Since the end of the Paralympics in September 2016, the site has been little-used but is set to host the 2017 Rock in Rio music festival this coming September. Fluminense’s latest proposal involves building a 25,000 seat stadium at Olympic Park using materials recycled from the dismantling of the Future Arena, which was used during the Games for handball, volleyball, and goalball. In order for the Olympic Park deal to go through, however, the team and City Hall would have to agree to modify the club’s earlier plan from last year, which also involved building a stadium in Barra, but at another location. That earlier plan was revealed in late 2016, when then-Flu president, Peter Siemsen, announced that the team had reached an agreement with City Hall for a plot of land for the construction of a new stadium near the team’s training facilities, close to Vila Pan-Americana. Neither City Hall nor current Fluminense club president, Pedro Abad, could be reached for comment on the proposed Fluminense Olympic Park stadium. However, Flu manager Abel Braga was more than happy to share his opinion when speaking to the media earlier this week. For Flu fans, news of a new stadium could not come at a better time as the team itself has been inconsistent so far in the current Campeonato Brasileiro (Brasileirão) Série A. After going winless in four straight games, the club may have finally turned the corner last night (June 21st), albeit against the worst team in the standings, defeating Avaí 3-0. At the time of writing, with last night’s victory, Fluminense stands at sixth in the standings with 14 points.